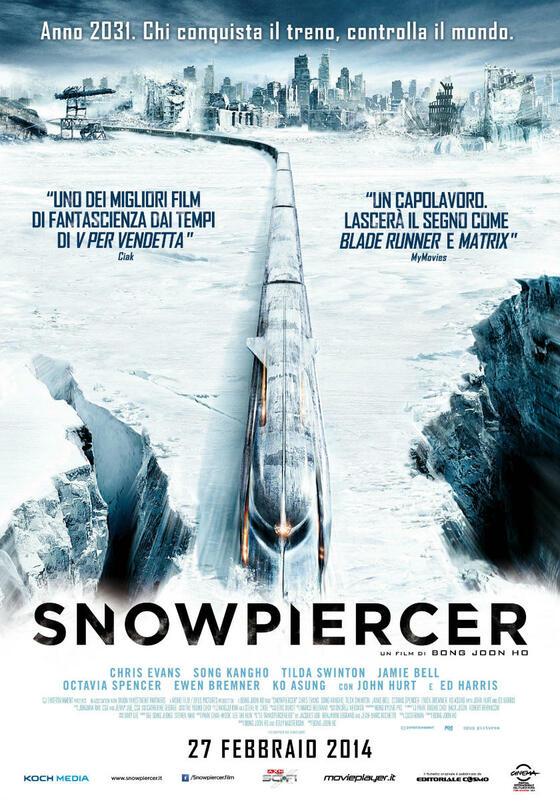 Snowpiercer is set in the near future where global warming has reached a critical point so that the world agrees to use a chemical countermeasure to bring the temperature back down to manageable levels. There is one eccentric train magnate who believes this will fail and launches this mega train that is completely self-sustaining and runs on an eternity engine. The chemical is released and brings about an ice age, killing the entire world except for the few people who were able to get on this train. Seventeen years later and the train is still going strong, but there is building tension between the upper class first class ticket holders near the front of the train, and the lower class passengers in the tail of the train who were the stowaways and freeloaders. This movie follows their revolution led by Chris Evans’ Curtis to try and reach the front of the train where the messiah-like magnate Wilford resides by himself in the engine room. That concept alone leads to some unique and interesting moments. During the revolution, the fighting is restricted by the width of the train cars and there is only one way to go; through the door to the next train car. Each car is also very different from the next one, from the tail end slums filled with bunks reaching from floor to ceiling, draped with rags and trash, to the more luxurious cars towards the front of the train like the aquarium car, the dance club car, and the sauna car. There’s also a great tense moment where the train follows a loop and there is a shootout between Curtis and one of the front’s enforcers. There’s also one of the best fight scenes early on when the tail end faces a large group of enforcers wearing black ski masks covering most of their faces except their mouths, and they are all carrying axes. They gain the upper hand when they come to a tunnel as they all have night vision goggles, but the tail enders bring torches to even the odds. One of the things I liked the most about this movie was how it transitioned in the third act, where it started bringing up Matrix-like philosophical elements without being quite as obtrusive as the Architect’s speech. Within the train’s closed ecosystem, there has to be a sense of balance and one way to maintain this balance is through these violent uprisings which end up being an excuse to cull the population to more manageable levels without resorting to some sort of lottery or flat out cold-blooded murder, though I’m sure there could be other options that could be explored, they aren’t presented by this movie and I’m ok with that. If I had any problem at all with this movie, it would be with the ending, spoilers ahead: the security expert has a theory that it has been getting warmer over the years and it’s been long enough that the outside could possibly be survivable, so he and his daughter blow open the side door which causes a chain reaction avalanche which throws the train off the tracks, and many cars off a steep bridge with the only remaining survivors being the engineer’s daughter and the young son of one of the tail enders who see a polar bear in the distance and believe that everything is going to be ok even though it’s likely that everybody else who was on the train is now dead. There’s also the thread that two of the young children of the tail enders were taken to the front for reasons unknown, and it turns out that children are the only ones small enough to fit inside some of the train’s access panels to do manual maintenance in place of parts that had worn out and are unable to be reproduced. Within just the short few days that they were gone, they seem to have become like mindless zombies doing these tasks. But looking past those two things, I still absolutely loved this movie and I can’t wait to watch it again soon. Until next time, this has been Bubbawheat for Flights, Tights, and Movie Nights. Posted on April 29, 2014, in Other Comics and tagged film, graphic novel, movies, review. Bookmark the permalink. 15 Comments. Loved this film a lot more than what I was expecting. Haven’t seen this one yet but it sounds really interesting. Thanks for sharing! I look forward to hearing your thoughts on it when you catch it. It’s a very interesting one. Not Park Chan-wook–the director is Bong Joon-ho. Park Chan-wook is best known for the Vengeance trilogy, which featured Oldboy. Bong Joon-ho isn’t shy of some violence, but it tends to be much more…gentle…than what’s on offer in Park’s films. They are both very good South Korean directors, but some significant stylistic differences between the two. That’s what I get for writing from memory rather than double checking my facts. Thanks for the heads up, it’s been corrected. I’ve just watched this and enjoyed it a lot. It’s not a perfect movie and comparing it to Blade Runner on the DVD cover is exaggerated but still a great movie. I especially like the visuals and atmosphere of different cars and the feel of uncertainty what’s behind the next gate. Highly recommended. Also, great review Bubbawheat. I like reading your reviews after watching a movie to see if I had same or different thoughts. This time I couldn’t agree more.